We were in search of wall murals for our latest IG yoga challenge when YaYa told us about a secret place tatted up with graffiti. A quick internet search revealed a little history, the location, and one other fact. Technically, access to this [not-so]-secret place was off limits. In other words: Trespassing. Still, articles posted by radio stations and the like seemed to be inviting the curious cats to check it out. Often fascinated by graffiti, I also wanted to check out this secret place. I invited theMAN to come along with me – although it went against my rule-following persuasion. We planned a trip mid-day to eliminate any doubt of the intent to simply check it out. The place was cool but there were definitely a few sketchy areas where an unlucky fall would not fair well. 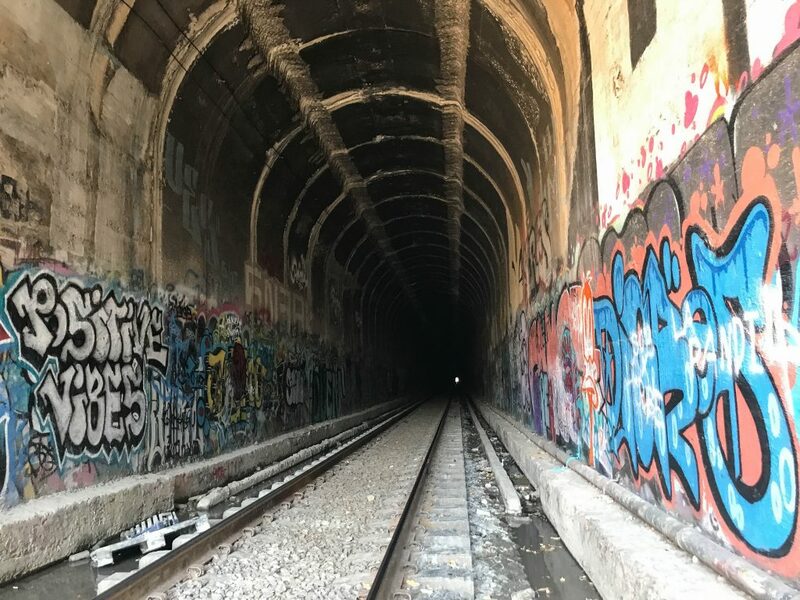 I could only imagine kids drinking at night then trying to safely traverse the embankment or heading into this tunnel with a train coming. I found that even I got sucked in, forgetting to weigh the dangers more heavily than the coolness. It was like a woozle-effect of sorts. There was a specific part of the trail which I’d seen in photos and was seeking to find. The graffiti in that section is more beautiful than all the rest. It would be the location of my IG challenge pose for a backbend; the arch in my backbend would align with the arch of the bridge above. I never did find this particular spot and the day for the backbend has come an gone. I did find another cool location here to stop-drop-and-yoga. There’s a part of me that really wants to go back…and another part of me that says “once is enough.” Most likely, I’ll listen to the second.